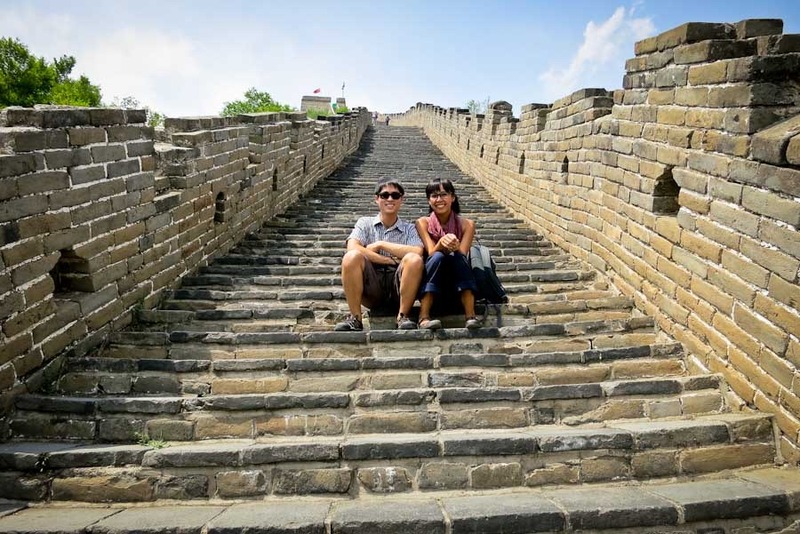 We made it to the Great Wall! And our journey to Mutianyu. 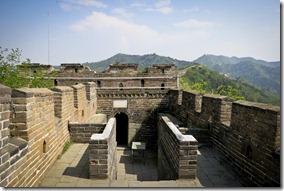 The Great Wall of China was built mainly to protect the Chinese Empire from invasions from the North. 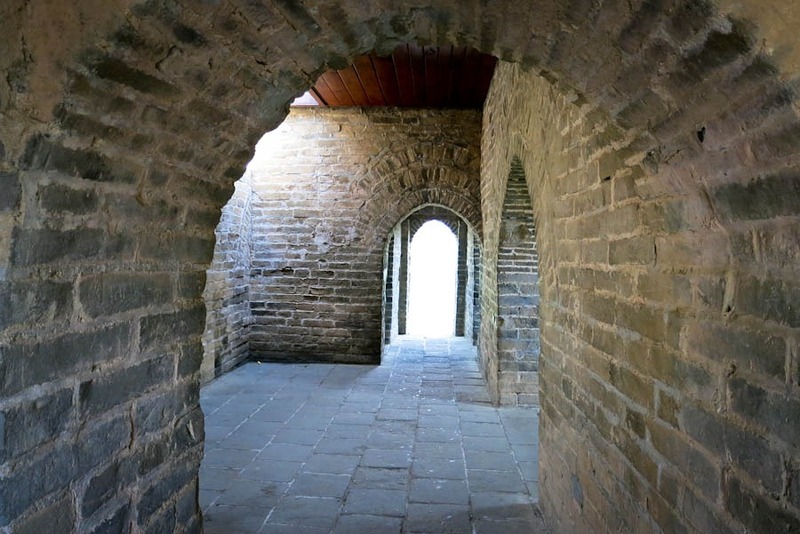 It was built in sections made of stone, brick, wood and other material as early as the 7th century BC. 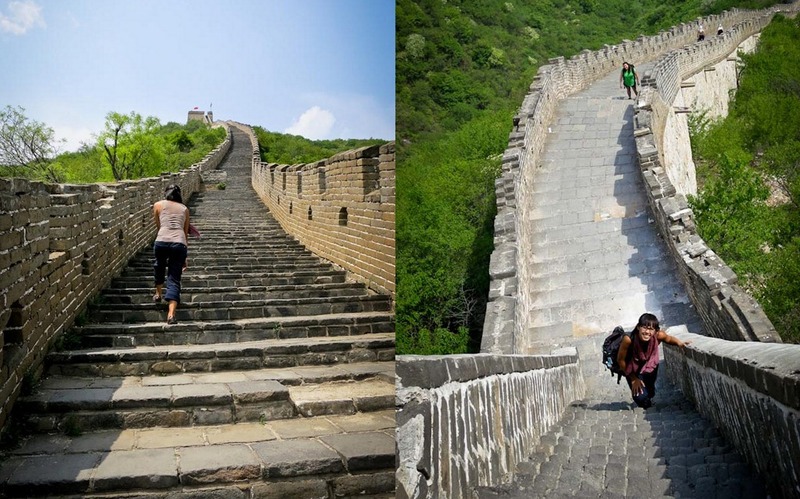 Later it was joined together into the Great Wall we know today. Obviously I left out centuries of in between juicy details, but hey, you don’t have to be a history buff to be struck speechless by the Wall. 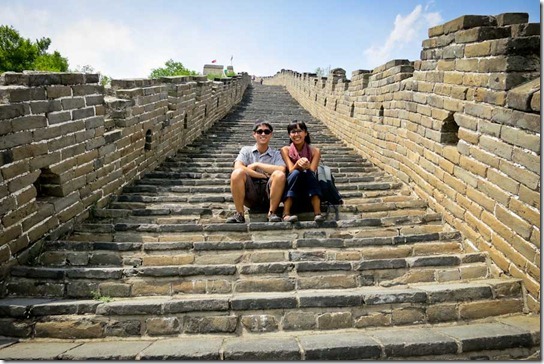 We opted to visit Mutianyu over Badaling mainly to avoid tourists. 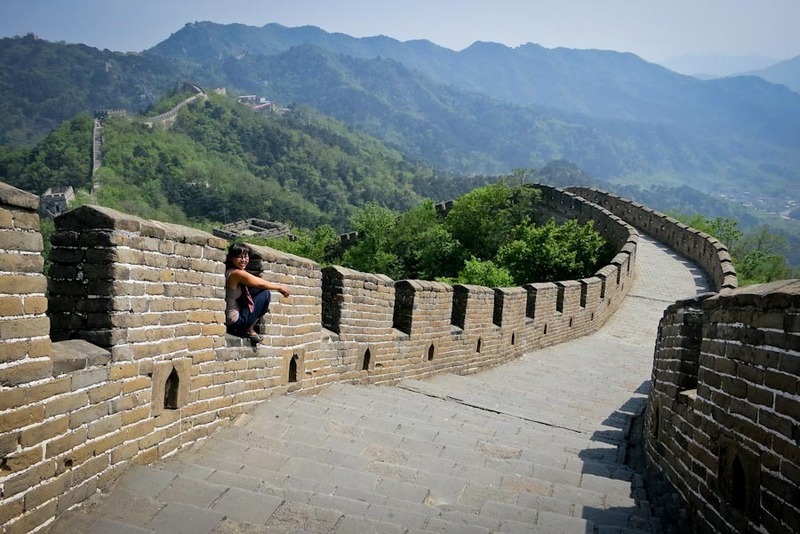 And maybe it was timing, or maybe it is in fact, less touristy, but we had the Wall practically to ourselves. The wall is not for the faint of heart. Towards tall tower #20 is where it gets steep with large steps. I struggled to make it to the top, crawling at times. Quit twice actually but eventually made it. But the view at the top was well worth the leg work out. For the most part, it’s a steady slope with minor up and down and a few towers along the way. The easiest route is from #15 where the cable car drops you off to #6 where the Toboggan is located. I felt transported back in time as I walk alone along the wall. With each uneven step, I took in the uninterrupted surrounding forested mountainside and the slopes of the wall. It was one of those moments where I just had to sit down, breathe and take it all in. To read it, hear about it is nothing like seeing the real thing in person. Gerard felt the same. And while I was in absolutely awe at the sheer fact that I was sitting on the Great Wall of China, at the same time, I couldn’t help myself from throwing karate chops whilst singing..
Let’s get down to business.. to defeat.. the Huns! 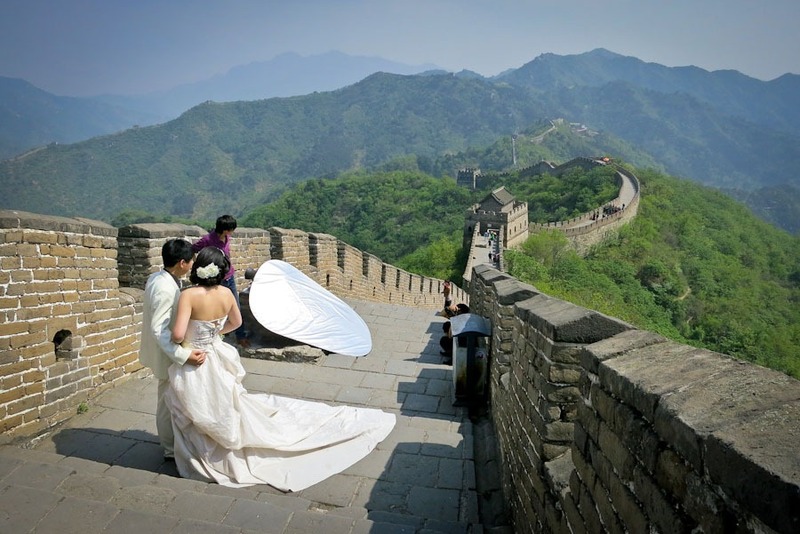 Having less traffic than Badaling, Mutianyu is a hot spot for wedding photography. We ran into two photo sessions on our way down. The best part, other than climbing the Wall itself, is literally the ride down. 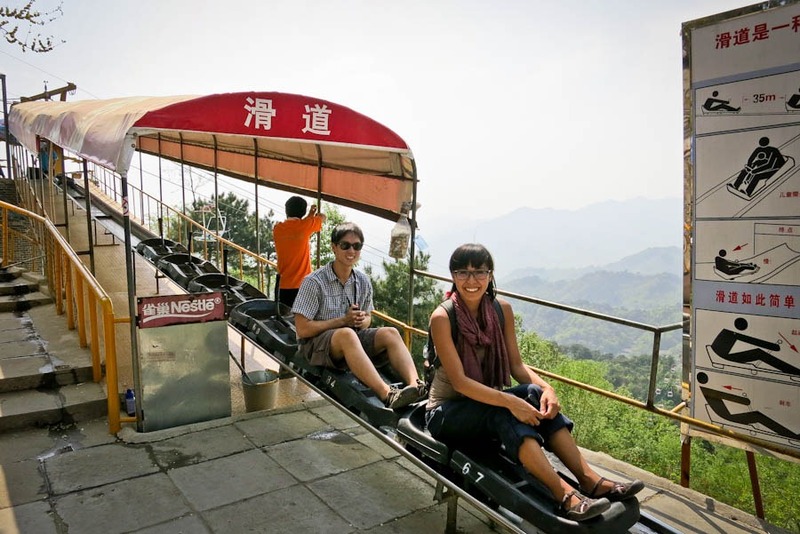 Mutianyu has the Toboggan – a luge at marker #6 where you can ride all the way down to base. It’s not hard to see why The Great Wall of China makes it to most people’s bucket list of must have experiences. A truly incredible piece of history and one of man’s greatest creation. 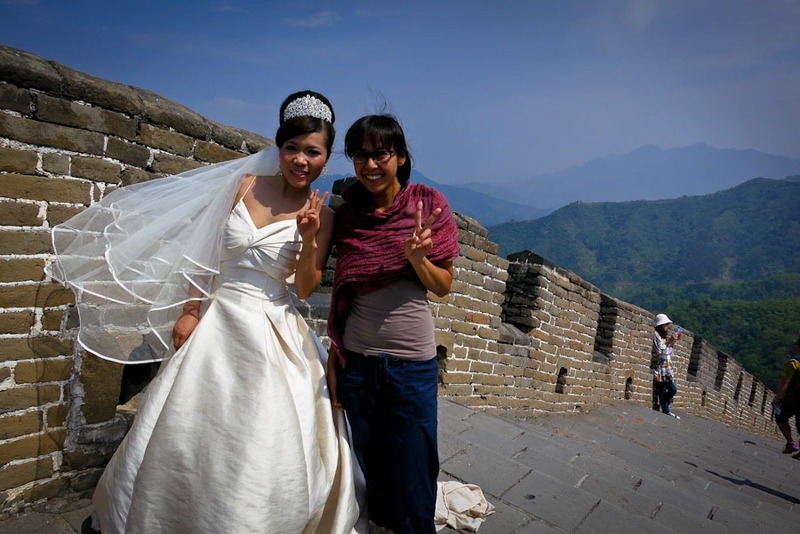 This along with visiting the Terracotta Warriors in Xi’an far exceeded any expectations I previous had. Definitely worth our short trip to China. Take the Tourism Bus No. 867 at Dongzhimen. Here is a helpful guide with directions on how to get to the bus station which is located down the street outside of Subway Line 2. The ride cost 16 RMB and takes approximately 2.5 hours. You can either take the same bus back or opt to split a shared van to take you down to bus stop in Huairou to catch Bus No. 916 – the Express Bus back to Dongzhimen. A little more than an hour ride and we only paid an extra 30 RMB for the shared van with 3 other tourists we met on the wall (you might be able to bargain down to 10 RMB/person). Not including the bus fare itself which is 12 RMB. The entrance fee cost 45 RMB. Cable car and toboggan are separate – 60 RMB each. There is a Subway if you wish to grab a sandwich before heading up the Wall. Buy your water and snacks before entering for cheaper prices. Bargain for water – At the base they say 5 RMB, you say 3 RMB. It’ll cost more on the Wall. 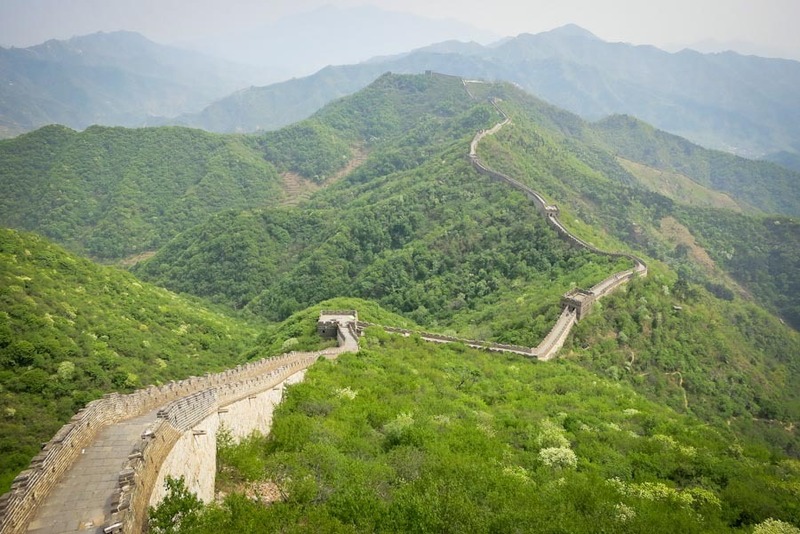 In more exciting news, a new and forgotten section of the wall was just discovered earlier this year deep in the Gobi desert and outside of China! Excited to see how that story unfolds. How about you? What do you find ‘great’ about the Wall? I have never seen a toboggan. Seems like fun 🙂 Thanks for sharing! Awesome photos – i love the one of you with the bride. Your photos are stunning and, as you say, worth all the pain! I had a similar struggle climbing up Dune 45 in Namibia…almost threw up but it was well worth it in the end…the best things always are right?! Love it! I always go to a “secret” section of the wall that is pretty run down and probably should be closed off haha, and it’s a hell of a hike (but well worth it for the lack of tourists). This looks like you got the best of all worlds — a lack of tourists, decent (not crumbling) steps, AND the toboggan at the end! The le is well worth a return visit.mthe wall too of course! 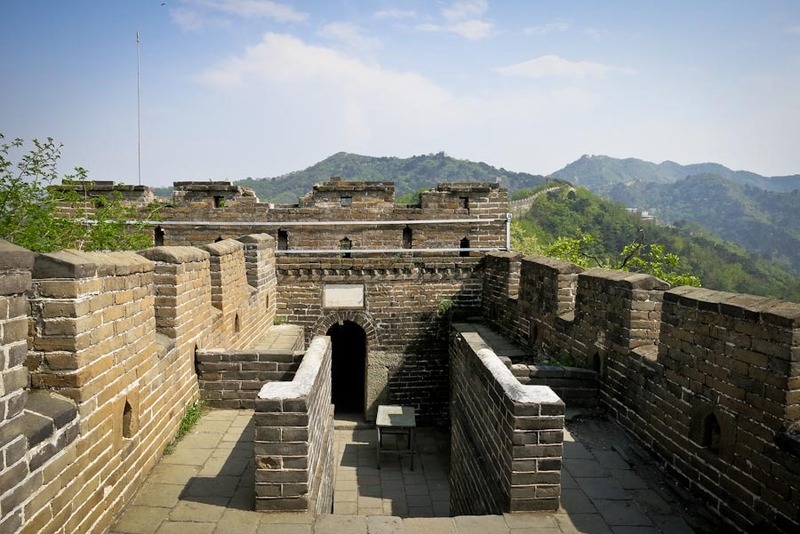 Unsurprisingly, the Great Wall is on my list of things I must see while in China, but I was a bit overwhelmed by all the potential sites to see it so this post has been REALLY useful as it looks like Mutianyu is a much cooler way to see the Wall than at Badaling. I mean, the lack of raging hoards of tourists is nice, but I think that toboggan at the end really seals the deal! Thanks for including details on how to get to this section of the Wall… I’m sure I’ll be referring back! What a great experience and fabulous photos (as we have come to expect). I hope to one day be able to cross this off my bucket list. I continue to live vicariously through you two. 2. 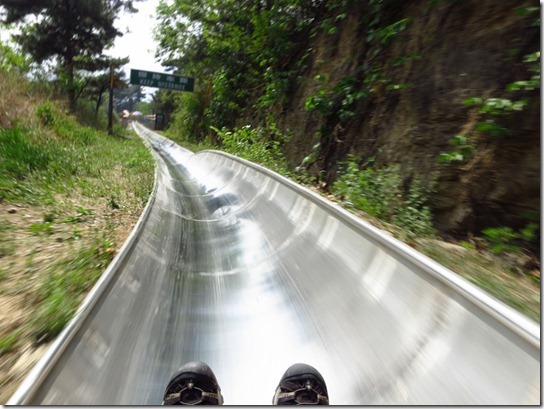 A luge to get down? So badass. 3. 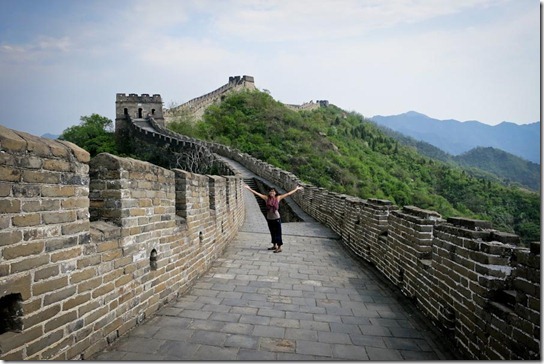 I really want to visit the Great Wall – it’s like in my top five “bucket list” things to see. Lovely photos! It really was pretty badass. You guys heading back to Asia any time soon? Still looks as beautiful as it did when I went there for my honeymoon 6 years ago. That luge you can take down must be new. I wish it was there when I went. Looks like so much fun! I love this post and your blog! How fun to take pictures with the bride! I can hardly wait until I get to visit! Thanks Heather! 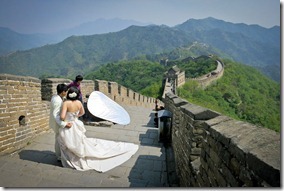 Isn’t it a great place for wedding photos?! Unreal.. The sheer magnitude and effort it took to create such a wall simply amazes me. Awesome photos! Thanks for the vicarious travel! You are most welcome! The history behind the Wall always amazes me. Oh man, I’m so jealous you got to toboggan down from the Wall. I could have really used a toboggan to get down from the Wall when I did the 10K on the Wall… running down wasn’t nearly as fun. Or fast! I did the same section of the wall except at the end of winter so we could have easily made our own toboggan ride on the wall itself due to all the snow. FYI…totally sang to Mulan as I read the quote. Ooo.. sledding down the Great Wall – now that would have been cool. I already wanted to go to China! After reading this it went on top of my list! No joke… It’s seriously fun! I just got back from 3 weeks all over China, and I’m so glad I’m not the only one who thought of Mulan! We looked at every hostel we stayed in for a copy and no one had it! Glad you had good weather, both days we went to the Wall it was foggy and rainy, couldn’t see more the 15 feet in front of you. Lol, me too! Our Internet was too slow to download the movie. Wow, can’t believe you guys were fogged in. Did you get any great misty shots? I just loved the Great Wall! 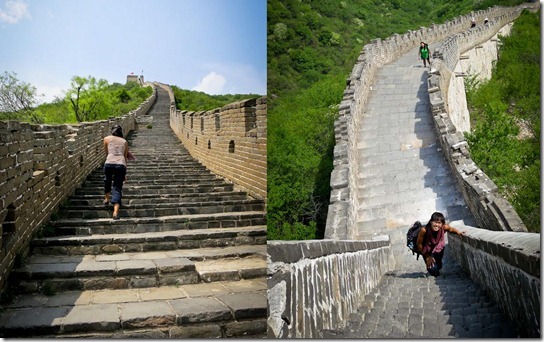 I felt unfortunate to go to the Badaling instead of this and your photos are just awesomely inspiring! 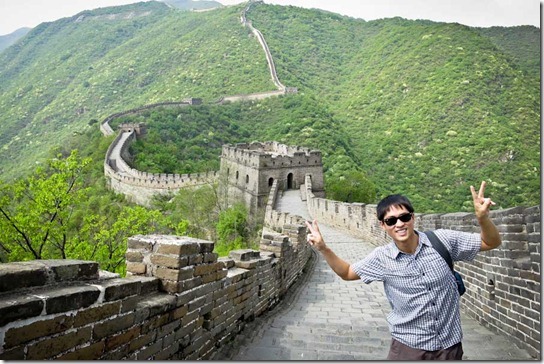 I will get to this part of the wall when I go back to Beijing in the future. Hi GQ, nice to see there’s not much tourists in your photos – mostly just the two of you. What time did you visit? We were there from 10am-2pm. The key is to avoid the weekend. We visited on a Thursday. It’s also about timing.. And the Mutianyu section is less visited Badaling. I can’t wait to visit this next month. 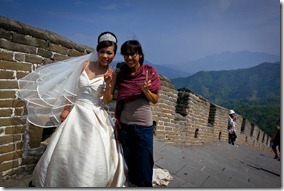 We will be visiting Mutianyu and hopefully, lucky like you guys, we will avoid all the photo bombers.